Bought these for my mom as an add on gift for mothers day. I always buy her some type of pearls & different jewelry for mothers day & pearls are one of her favorite stones. They are a nice size, a very great price and the colors are amazing. I know some pearls you get they fall off of the earring post. Not these they are great. I bought the jewelry warranty though just in case. Better to be safe than sorry. Complete your daytime or evening ensemble with these elegant pearl stud earrings, available in a classic button style that flatters your face without interfering with your hairstyle. 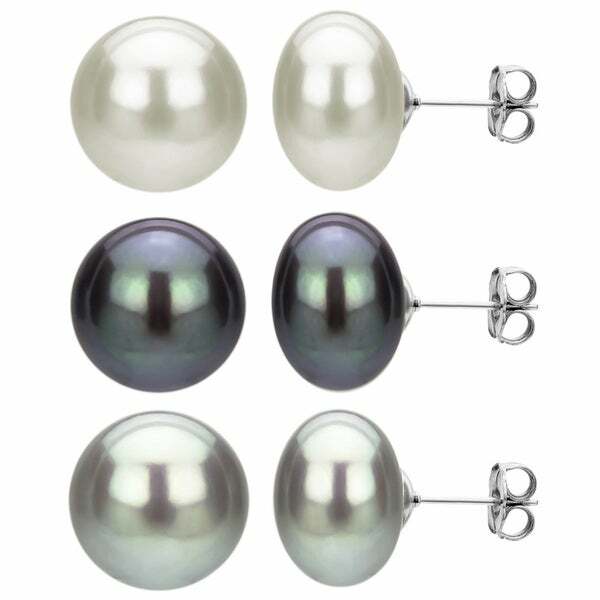 This set of three pairs includes white, gray and black pearls so you always have an option that complements the outfit of the day, from a chic business suit to your lucky team jersey. All three pairs of pearls carry a high-quality AAA grade for long-lasting shine and durability, and the sterling silver setting is gentle for sensitive skin. Butterfly clasps are easy to fasten, keeping the earrings securely in place throughout your active day. All carat weights and measurements are approximate and may vary slightly from the listed dimensions. Treatment code N (white pearl) and D (colored pearl). See Gemstone Treatments for further information. A high quality product at an excellent price. I would recommend this product to friends. I LOVE these earrings. Very pretty. Very elegant. Good quality. I havent been disppointed yet with Overstock jewelry. The earrings are a very nice addition as a wardrobe essential. They compliment a suit or can be worn with a nice sweater and jeans. I was very pleased with them. Is it silly of me to expect that one would base what they are looking for on the pictures of the product when searching online?? Why don't the picture and description match?? I saw the picture of the earrings in the blue colors and knew I wanted it immediately. It was my mistake I guess not to read the details in full. It does mention there the colors you actually get are grey, black and white. So needless to say I opened and was immediately disappointed. However, I do not have black or grey pearl earrings, so I took them out and examined them anyway, maybe I can still use them. Always willing to add to my collection. The colors and quality are really cheap looking. Don't get me wrong...I wear knock off jewelry all the time since I have the habit of losing earrings. These earrings are nothing I could ever wear to work or out on the town though. They are too obviously fake. I would not recommend and will be returning. Honestly I do not understand all the positive reviews. I actually bought this set for the black pearls but since I have had them I wear the gray pearls the most out of the white and black pearls. All three pair are beautiful. Perfect for everyday wear!! Talk about a deal! Three beautiful pairs of earrings for one low price. I have a black pearl necklace and wanted earrings to match. Both the grey and black complement the necklace nicely - I love the colors. The white earrings have a beautiful iridescence, as do the other two pairs. These seem more like high quality salt water pearls than fresh water, which can sometimes be unevenly formed. I'm very happy with this purchase! Amazing quality!! Because of the great price, I was skeptical about the quality however, I bought several sets as Anniversary gifts and, years later, they are still as big and beautiful as the day they arrived. I not only see my sister n mom using the earrings but, my nieces n are always borrowing them and, my daughter used the classic white on her wedding day. It was a great gift that will last generations. These are great pearls for the price. They arrived as described; one black, grey & white pair of stud pearl earrings. The grey pair had a minor indentation, but it was close to the post so no one will ever notice it. ... They are grade AA pearls so I expected some imperfections anyway. The other 2 pairs showed no imperfections. Great for everyday use. The sterling silver posts are a nice touch. .. Not cheap as another reviewer said. I was surprised when I recieved these studs. The perals are close to size on each earing, the color is beautiful and shiny, sterling silver posts are high quality and the backing feels secure. The white pearls were actually bigger than the silver and black ones I tried on. I expected smaller, overall happy with this purchase and would highly recommend them, escpecially for the price I paid, what a deal! I ordered on a monday and recieved them on a thursday, the only thing is I had ordered two other pieces of jewelry, Im assuming they all ship seperately because I only recieved the peral studs today. These were given to me as a gift from my better half. I wanted a gray pair of pearl studs (I have silver gray hair), and these are a nice color, plus I got three pair! Be aware that the "black" pair have a purple sheen to them. Very nice luster for the price, and a perfect size. Although the earrings looked as expected, after a very short time of wearing them one of each pair fell apart. The pearls are not adhered very well to the backs. I bought these earrings for my 13 year old daughter and she adores them. The pricing is excellent. Overstock.com is the best! The ones that were shipped to me were not anything like the picture. When I picked these out, I wanted to make sure that the pearls were round, which was what was described in the description and depicted in the picture. They have more of a doughnut shape and are not fully round (like they were round and were smashed against the post. I am going to keep them since it would cost almost as much to ship them back, but I would not recommend them. The colors are however fairly accurate. I bought these as a gift for my husband's wife for the holidays. I had them shipped to me first and then sent them to her. I thought they looked really neat, just as good as the pictures. She loves them. I was under the impression these earrings were sterling silver but my daughter ended up with infected ears after wearing these earrings for a few days. Not sure what’s in them but I wouldn’t purchase if you have sensitive ears. They are wonderful. Exactly as shown in the picture. Very cute earrings. More flat than they are round. Perfect size too. They are medium size. Only con would be that if your allergic to non silver these wont be for you. Not real silver. Love them! Perfect size and great quality! Bought as a gift for my wife, they burned her ears and left green spots. A few of the earrings were visibly different sizes and shapes. Cheap junk, msrp at *** is laughable. "What is the packaging like? Is it suitable for gift giving?" It is a brown hinged box that will be suitable for gift giving. I bought 3 sets of similar earrings from overstock as anniversary gifts... They were beautiful and I have had no problems at all with them... My daughter even wanted a set even though she didn't particularly care for pearl earrings initially. "are these earrings hypo alergenic?" No these are not hypo-allergenic. "I rec'd this product. I like the color, but a pair (gray) is definitely bigger and rounder. The other 2 pair are smaller and more pronounced "button" shape. When measured, the round shape gray pair is 8-9mm across the top and maybe 8mm wide, from stem back. However the others are only 6 or 7 mm across the top, and maybe 5mm from back of stem. should I just return 2 of the 3 pair?" Customer service has already arranged a return, and you have been sent a full replacement. If you have any further questions, please feel free to ask.